Well, I finally got around to hiking to Fortynine Palms Oasis early this January. The call of the trail was always there, lurking in the back of my mind with all those other cool destinations awaiting their turn. When it managed to bubble to the surface (kinda like those bubbles you see at the La Brea Tar Pits), I thought, why not? Tac3 had been ready to go for a while, so early that Monday morning I hit the road. 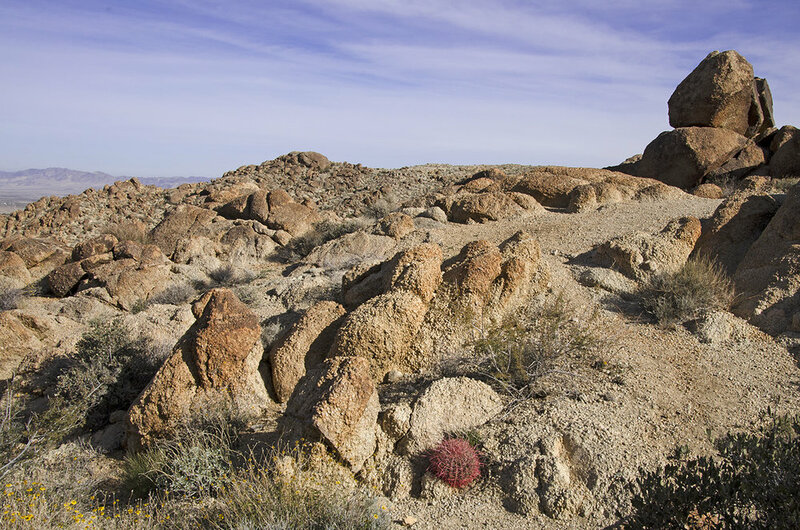 The trailhead to the oasis is not in what most folks consider the ‘normal’ boundaries of Joshua Tree National Park. 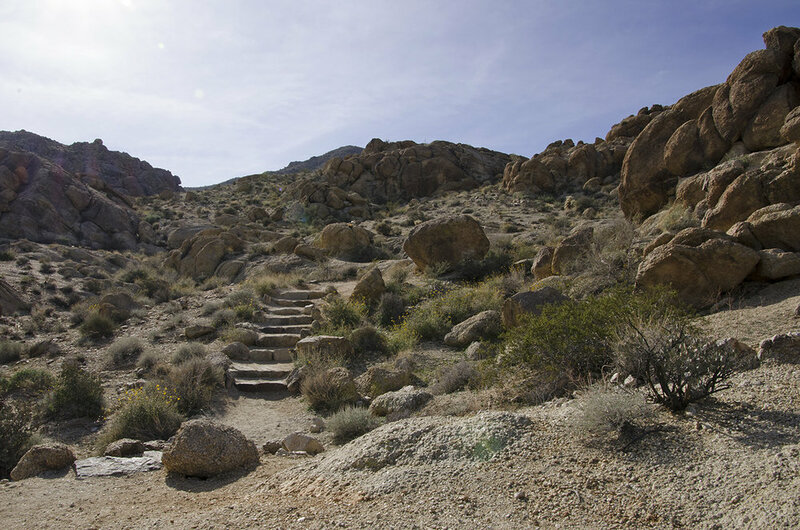 It’s located off Hwy 62, near the town of Twentynine Palms. Canyon Road heads south from 62, Fortynine Palms Road branches off to the east and takes you to the trail head. I was visiting during the government shutdown, so the gate across the road was closed, but there was ample parking and the trailhead was located about a quarter-mile in from the gate. After gathering my possibles, I headed toward the trailhead along the paved road. There’s a nice-sized parking area adjacent to the trailhead, which makes sense as the oasis is a popular hike. The restroom was open and stocked, most likely thanks to local volunteers who have been doing all they can to help keep the park open during the government shutdown. There’s a nice BIG thermometer right next to this sign, no doubt placed to help people realize just how hot it can get out here. This is not a hike I would recommend during the summer, or any really hot day, as there is NO shade along the entire trail until you get to the oasis. I’d rate the hike as moderate, only because of the compressed altitude gain and the lack of shade. That being said, if I could do it, I’m pretty sure most folks in decent shape can do it as well. It’s roughly a three-mile round-trip hike, there and back. It’s basically uphill to the halfway mark, then mostly downhill to the oasis. If you’re a fan of stairs, you’ll love this hike. Just be ready for some high stepping. This was the first time I’ve seen a sign like this in JT. It’s not an idle warning. A hiker went missing last July, his rental car found in the trailhead parking lot. He still hasn’t been found. The trail is fairly straightforward. It’s a well-used single track with a rare sign pointing the right way at spots where it’s needed. A few small “traillettes” branch off here and there, but for the most park the trail is hard to miss. No Joshua Trees along this trail. No Pinyon Pines. I don’t remember even seeing any Juniper. What I did see was a lot of was native Ferocactus cylindraceus, also known as the California barrel cactus. In fact, I think I saw more of these red barrel cacti along this trail than the total amount I’ve seen in the entire park. There’s a lot of empty space out here, with some large boulders, and probably hidden treasure. Ever upward on onward. As the day progressed, a few groups of hikers passed me by, no doubt because of my frequent stops to take pictures…. One nice thing about hiking up, some amazing views open up the higher you go. 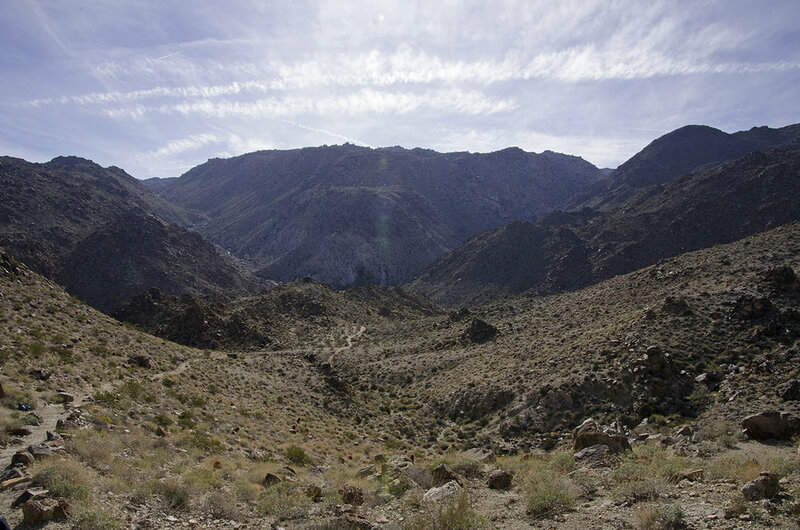 This is looking down towards Twentynine Palms and out beyond. It was definitely a great day for hiking this trail. Temps may have reached 70°. One of the many south-facing slopes that was dotted with barrel cacti. I was clueless at this stage of the trail, but off in the distance, through the notch in the closer hills, you can actually see a major portion of the palms that surround the spring that creates Fortynine Palms Oasis. Approximately halfway, mostly downhill from here on out. This part of the trail was much more pleasant going TOWARDS the oasis than when RETURNING from the oasis. I still hadn’t noticed the palm trees in the distance. Photo tip: to get the majority of the palms in sunlight, arrive sometime after 2:00 pm during the winter. The Fortynine Palms Oasis. Pretty cool to find out in the middle of the desert. 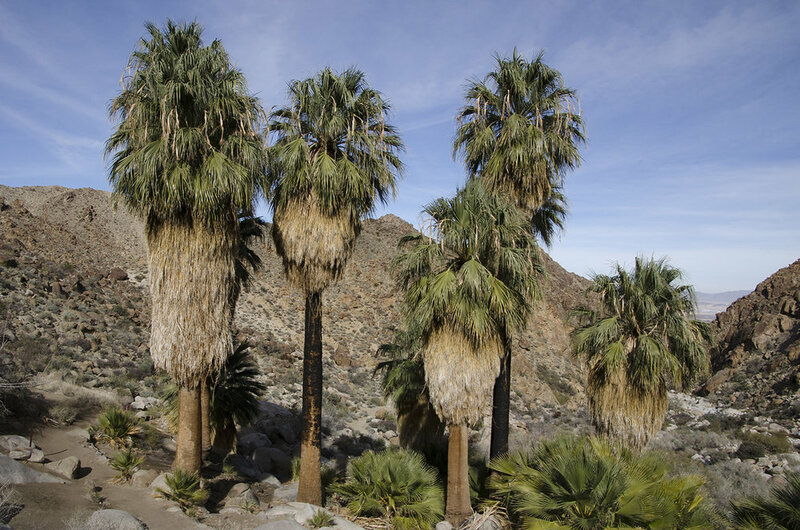 Made up of Washingtonia filifera (the only native California palm tree), they only occur is very specific places in our deserts. Five of which happen to be in JTree. And just to keep things totally transparent, I counted more than forty-nine palms at the oasis. I didn’t see any open pools of water, but I didn’t go down into the trees to look for them, as the area is marked as sensitive and requests visitors to stay on the trail. The Gallant View above. The Goofus View below. I wish there weren’t so many Goofuses. A beautiful place. And then it was time for the return trip. A last look back, the sun was finally starting to creep over the mountain top and begin to bring more light into the canyon. A portion of the rocky stairway to the top. Definitely a good workout on this trail, I’ve heard it’s a favorite with trail runners. Me? I’m a trail walker and I enjoyed it too. Like any other trail in JT, be prepared. 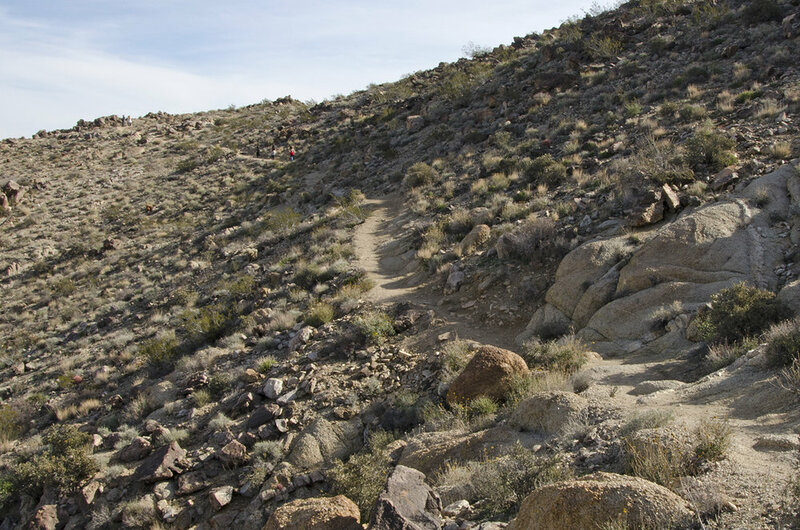 Take plenty of water, some snacks and stay on the trail if you’re not familiar with the route. Stay aware of where you are and where you need to go. Look backwards now and then to locate landmarks you can use on your hike out. Stay safe and have fun when you’re out there looking to see what you can find. Feel free to download any of my pictures for your own personal use, if you use them in any published work, credit back to Cali49 would be nice. Please leave a comment if you’re so inclined.